Marc Chagall’s Belarus hometown celebrates first synagogue opening in a century. The hometown in Belarus of the late artist Marc Chagall saw its first opening of a synagogue in over a century. The Jewish community of Vitebsk, which is located 155 miles northeast of the Belarusian capital of Minsk, last month celebrated the inauguration of the new synagogue at an event attended by city officials and faith community leaders from the Christian Orthodox and Catholic churches, the Belta news agency reported. Vitebsk’s rabbi, Malkiel Gorgodze, affixed a mezuzah to the doorframe of the new synagogue, which was built with municipal support near the city’s Chagall museum. The new synagogue, Ohel David, is built of the red bricks for which Vitebsk — one of Belarus’ most beautiful cities — is known internationally. Boasting a capacity of several hundred worshipers, the synagogue’s unusual design has one of its corners towering above the other three and a white streak accentuating the outline of its roof. Both facets making up the elevated corner have a single large and round window with a Star of David trapped in its frame. 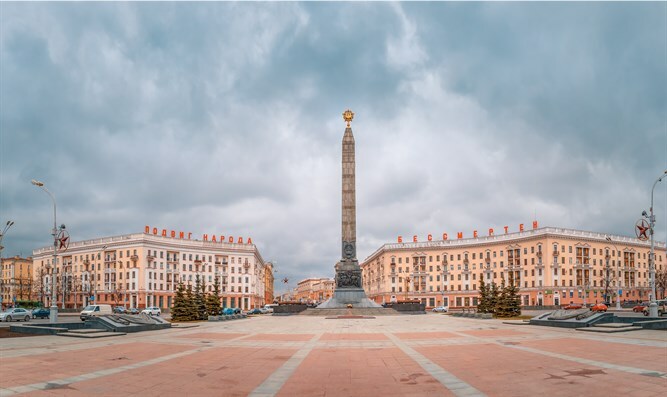 “Vitebsk is a historically Jewish city,” Leonid Tomchin, the chairman of the Jewish community of Vitebsk, said at the event, which drew a crowd of several hundred people. Tomchin noted that at the beginning of the 20th century, more than half of the city’s population was Jewish, with 64 synagogues in Vitebsk. “Today there is only one, unfortunately, but even this synagogue can and will be a center of Jewish life,” he said. The vast majority of Jews who lived in what is today Belarus were murdered in the Holocaust. Today the city has a few dozen Jews. The new synagogue replaced an apartment-sized place of worship that was too small to accommodate all worshippers during holidays, Tomchin added. Chagall, a Cubist painter known for combining many Jewish symbols in colorful works described as naïve and featuring dreamlike scenes, immigrated to the United States to escape the Nazis. He died in 1985 at 97. Separately, the Jewish community of the city of Simferopol in Crimea celebrated the inauguration of its first chief rabbi after its annexation in 2014 by Russia. The new rabbi is Yehezkel Lazar, who is a son of Berel Lazar, a Russian chief rabbi. Lazar enjoys good ties with Russian President Vladimir Putin. The Russian annexation of Crimea from Ukraine following the toppling in a revolution of its president, whose opponents said was a corrupt Russian stooge, is not recognized by the international community. Many Crimean Jews – there are about 10,000 living on the peninsula – welcomed becoming Russian citizens.